Ok. Laugh now, but I expected Safari would “just work” with my application as Chrome did. I wasn’t using any fancy HTML-5 or anything, so why wouldn’t it? 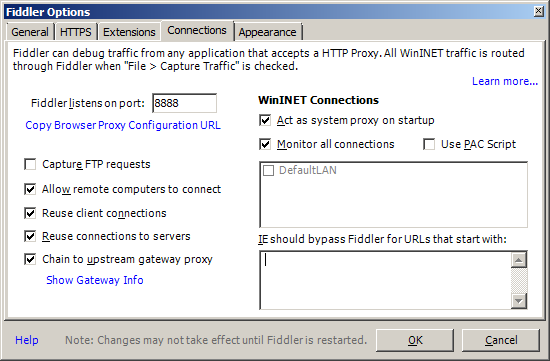 But it didn’t work, so I jumped to Fiddler (which is absolutely great, BTW!). None of it helped. I investigated a bit further. All traffic to other sites would show up, but not to mine… and I wasn’t even hitting localhost, I was hitting my IIS instance using its hostname on the externally visible IP. So, I appended the domain name to my machine name (e.g. my-machine.mydomain). 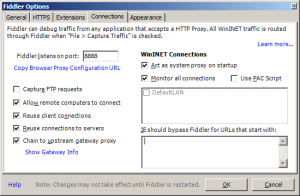 Fiddler instantly picked up all the traffic… and my application worked perfectly. I’m not yet sure what Safari does differently when it’s referencing the server locally, but the behavior’s consistent at least. Today’s moral – if you’re running a web application and the host would be considered an intranet site, it may be worth checking with the fully qualified domain name.